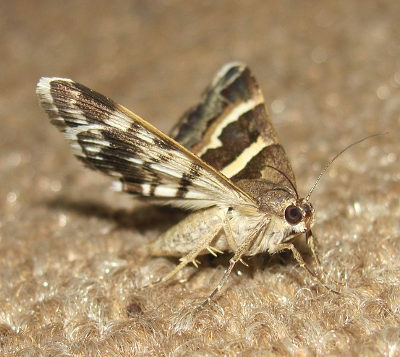 If your property is infested by moths, then you can easily solve this problem with the help of PEST XTERMINATORS. Book a moth control London service that will surely eliminate these annoying flyings insects. Also, your place will remain protected from cloth-eating moths for a prolonged period of time. Moths do their beast to be sneaky but you can usually easily notice them just flying around in confusion. Usually, they are attracted by light. What they aim for is to reach a place where they can lay their eggs. Your closet would be a perfect spot as the larvae feed fabrics made of natural materials. In addition, they can opt for the upholstery of furniture. Little holes on clothing are usually a sign of infestation. Other than being a nuisance that ruins clothes and furniture, they don't pose any danger to humans. When your pest control specialist arrives at your property, he will begin the moth extermination service by inspecting your property carefully in order to determine the level of infestation. This way he will be able to determine what kind of measures to take. The moth treatment consists of spraying the areas that are most affected with an effective insecticide. This is also known as moth fumigation. In case the infestation is very serious, the pest controller might resort to gas canisters as well. Usually, the surfaces that need to be sprayed are curtains, cupboards, skirting boards, walls and skirting boards. Your clothes won't be sprayed but otherwise this is an effective clothes moth and carpet moth treatment. When the service is over, your moth control specialist will offer to share with some great advice on how to prevent future infestations of such kind. If you have any pet animals, then remove them from your property prior to treatment. It would be best if you clean or hoover all affected areas as thoroughly as possible. When your moth treatment begins, leave the property for a while. When the treatment is over, let your home stay empty for at least two hours. Once you get back, air out all rooms for at least ten minutes. Do not hoover or clean the affected for a period of at least four days. Moths are nocturnal flying insects and vary in size, shape and colour. The types that invade homes are the smaller, less noticeable. They are either brown or pale gray. Moths will feed on stored pantry food and whatever leftovers they can find. An ideal scenario for them would be to lay their eggs in a closet where the larvae can feed on the natural materials of clothes such as wool and silk. This company stands behind its guarantee. I hired them to help me with the moths I’d caught fluttering around and the first visit didn’t get the results I wanted. As soon as I called to report this, the technician was sent over that very evening, on a Saturday and charge-free. It took one more visit to get the insects completely gone but I’m very satisfied nonetheless. Moth were feasting on our clothes, we threw out so much and we never quite figured out how they keep appearing everywhere. We chose this particular company, because they agreed to talk through the whole process. It’s a really important factor for us as we have children and companion animals. They pretty much tailored the service around our specific situation.